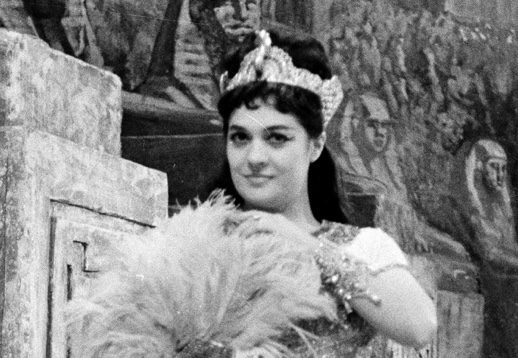 On this day in 1968 mezzo-soprano Fiorenza Cossotto made her Metropolitan Opera debut as Amneris. Since Fiorenza Cossotto’s fall appearances with La Scala Opera in Montreal and in the Verdi “Requiem” here in October in Carnegie Hall, her Metropolitan Opera debut has been eagerly anticipated. Last night it happened. She sang Amneris in Verdi’s “Aida” and was splendid. Beautiful, feminine and not so imperious her evil as some in the role, she captivated this listener with a high voice that soared to B-flats as easily as a soprano, and that could be menacing in the lower register without falling into the trap of heaviness. She made no compromise with sinister design nor overpowering jealousy in her interpretation but in her directness in shooting these to her mark, she was so natural as to be rather disarming. But upon reflection the listener realized that this was the core of her personality in the role and in her excellent interperation of it. Miss Cossotto’s voice is firmly, well produced, warm in quality and she sings with excellent rhythm and style. The Italian mezzo-soprano brings light to the roster. Martina Arroyo’s beautiful voice is at its best as Aida and she sang with limpid beauty. In Act II she had trouble getting into Amneris’ boudoir. She tried a curtain without success… But soon she glided around the corner and arrived on time. It seemed a little odd for an experienced Aida to lose her way, but no matter. The cher public are invited to share favorite YouTube clips of La Cossotto.